Explanation: Obscuring the rich starfields of northern Cygnus, dark nebula LDN 988 lies near the centre of this cosmic skyscape. Composed with telescope and camera, the scene is some 2 degrees across. That corresponds to 70 light-years at the estimated 2,000 light-year distance of LDN 988. 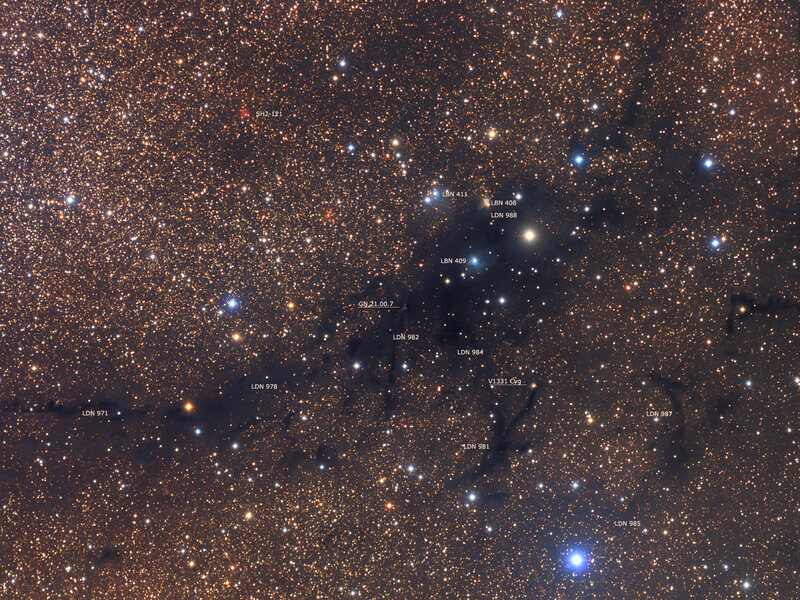 Stars are forming within LDN 988, part of a larger complex of dusty molecular clouds along the plane of our Milky Way galaxy sometimes called the Northern Coalsack. In fact, nebulosities associated with young stars abound in the region, including variable star V1331 Cygni shown in the inset. At the tip of a long dusty filament and partly surrounded by a curved reflection nebula, V1331 is thought to be a T Tauri star, a sun-like star still in the early stages of formation.